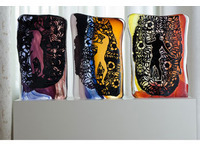 Eurydice is a group of three glassworks selected for the exhibition ‘Glasstress’ at the International Venice Art Biennale 2009 curated by Adriano Berengo, Laura Mattioli Rossi and Rosa Barovier Mentasti. 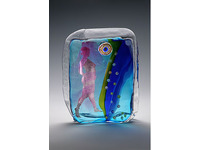 The Eurydice series arose from a body of artworks of more than fifty pieces in glass, commissioned and made at Berengo Studios between 2008 - 2011. 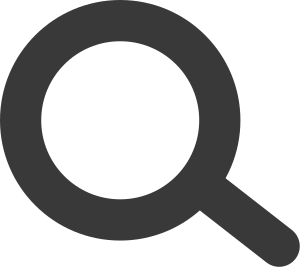 The artworks extended the researcher’s methodologies as a fine artist in which the hand craft processes of collage and drawing are the focus of practice-based research. 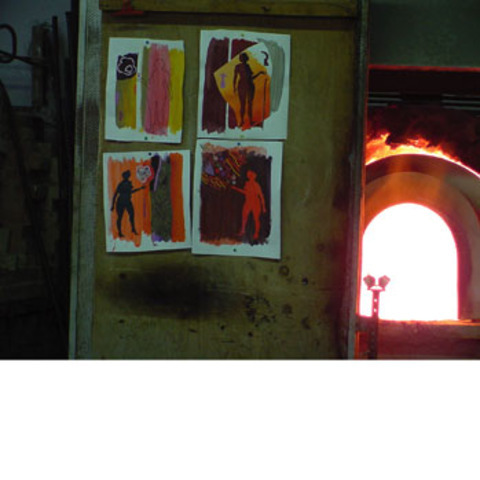 Fluid hot glass production is reliant on the development of strategies or ideas to be interpreted in close collaboration with a master craftsmen, in stark contrast to solo studio practice. 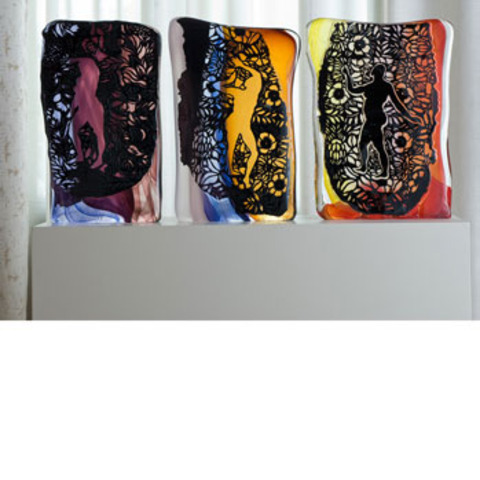 In order to maintain the quality of hand drawing the recurring motif of a female figure, a silhouette was hand cut from silver leaf and embedded into molten glass. 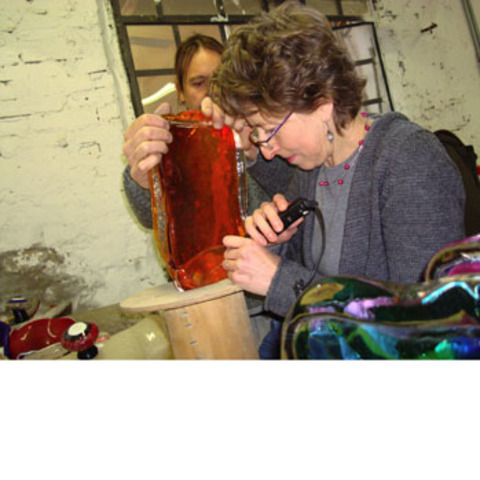 This represented a very different approach to the conventional use of silver as texture or embellishment. 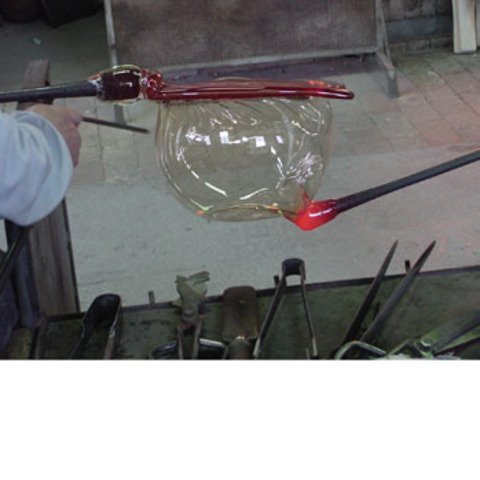 The glassworks realised a unique approach to the material informed not only by studio methodologies but also Venetian glass traditions which included the use of rich colour, Venetian glass beads and hand blowing. 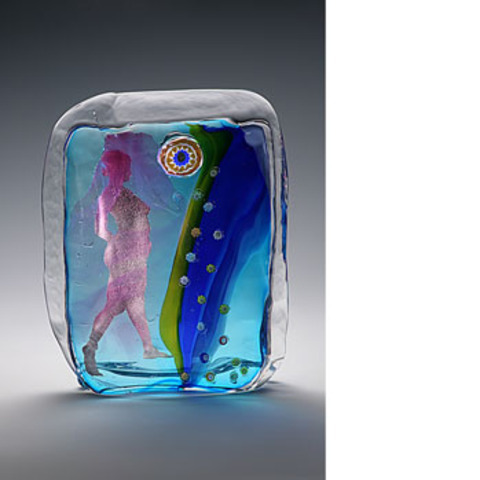 The 2009 exhibition reappraised glass as a fine art medium and featured work by 46 twentieth century and contemporary artists including Man Ray, Robert Rauschenberg, Louise Bourgeois, Mona Hatoum and Tony Cragg. 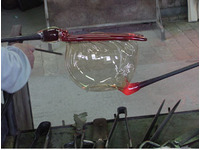 A further two glassworks developed from working on the ‘Eurydice’ project formed part of the related exhibition ‘Glasstress Stockholm’ at Millesgården Museum, Stockholm, Sweden in 2011. 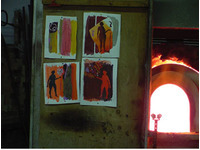 There were illustrated publications for both shows. 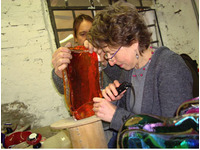 Glassworks, alongside two dimensional papercuts, were also included in the four person exhibition ‘Vertigo I’ at Venice Projects, Venice in 2010.